Epic fantasy is one the least prestigious genres of fiction, perhaps only surpassed by the supermarket romance novel, video game tie-in and that peculiar subset of cozy mysteries in which cats solve the crimes. And though there are a lot more decent fantasy novels than detractors might believe, very few can credibly claim to be significant works of literature. Andrzej Sapkowski’s Witcher Cycle is a rare exception. 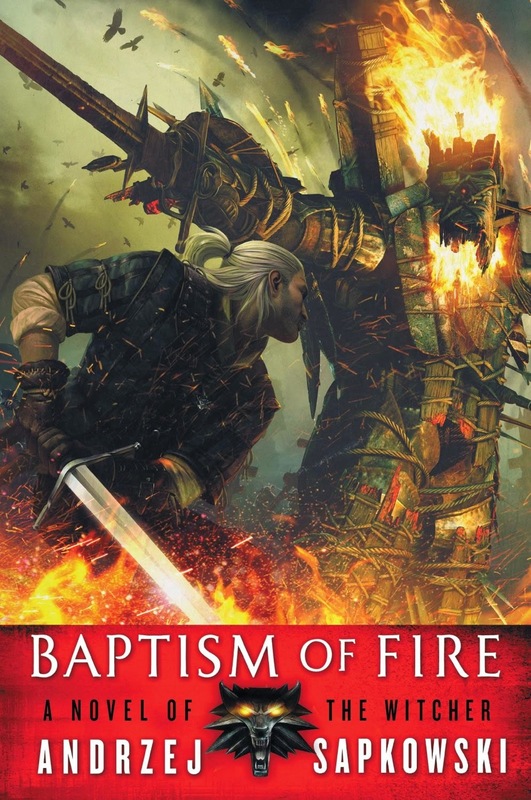 Baptism of Fire is the third entry in the Cycle proper, the fourth Witcher book available in English translation, and the fifth overall. Series neophytes are recommended to start with the linked short story collection The Last Wish (and then lament the fact that the second such collection, Sword of Destiny, remains untranslated. *) before moving on to Blood of Elves. Those who have not yet read Time of Contempt may also want to skip the italicized summary below, as it contains spoilers for that book. But first, some background: Sapkowski originally wrote the Witcher Cycle during the years 1990-2000, while fantasy was in the midst of a paradigm shift from the heroic archetypes of Tolkein and Howard to the pessimistic antiheroism that arguably stands as the institutional center of the genre today. And while all the great series of the 1990s are a part of that transition, none embody it quite like the Witcher Cycle. As detailed in reviews of previous volumes, the series begins with subversion—of fairy tales, Tolkein and all the tropes produced from that source material. The books are playful and romantic—yet sharply critical of the binary archetypes (good/evil; heroic/cowardly; virginal/depraved) that once dominated heroic fantasy. In Time of Contempt, the critique widens, portending a shift into grittier territory. Baptism of Fire begins in the forest of Brokilon, where the dryads tend Geralt’s wounds after his battle with archmage Vilgefortz on Thanedd. Here we meet the archer Milva, a rare human tolerated by the dryads. We find out that Milva, for unexplained reasons, works to guide shattered Scoia’tael commandos to the shelter of the forest after engagements with Northern armies, most of which do not go well for the elves. Word reaches Brokilon that the Emperor of Nilfgaard, Emhyr var Emreis, has captured Geralt’s protégé Ciri—heir to the throne of Cintra and carrier of the fabled “Elder Blood”—and plans to marry her in order to legitimize the Empire’s occupation of Cintra. Accompanied by Milva and the indomitable bard Dandelion, he crosses war torn lands in quest to rescue her. At this point, of course, there is little hope that Ciri can save the world, though everyone—from the Emperor of Nilfgaard to the Northern Kings to various Elven factions to a cabal of sorceresses plotting to redraw the political map—appears ready to use her for their own devices. Geralt simply wants to save Ciri from a life where she would be little more than a symbol and tool of the politically ambitious. Ciri, meanwhile, is not captive at the Imperial court, but a member of the Rats—a band of outlaws preying on the Imperial aristocracy near the northern border. As her identification with the Rats grows, the tether to former lives as princess, witcher’s apprentice and novice mage grow weakens, and Ciri herself grows increasingly hard and violent. As anticipated, Baptism of Fire is much grittier than previous entries in the series. The quest for Ciri takes Geralt and his companions across a desolate landscape of massacre, pillage and displacement, through harrowing encounters with the entrepreneurs of violence and fortuitous ones with like-minded souls. It presents a world engulfed by apocalyptic war between an expansionist, authoritarian and vaguely Teutonic Empire and the supposedly heroic kings of the north—who, when not losing battles to “evil” Nifgaard, are busy massacring elves and dwarves or herding them into decrepit urban ghettos. Many readers will doubtlessly intuit a link with A Clash of Kings and A Storm of Swords—books similarly sanguine about warfare in a medieval setting and equally contemptuous of heroic fantasy’s romantic notions of “the good war.” Like George R. R. Martin’s epic, the experience of war is painted in decidedly unromantic (grim and dark) terms. Yet in other ways Baptism of Fire contrasts with A Song of Ice and Fire—first and foremost in how it frames the central political conflict. Both begin with the assumption that power games are ultimately about hoarding and little else, and that cynicism and self-interest drive most political calculus. But in A Song of Ice and Fire, nearly everything is at risk, and most everyone feels they have a stake in the outcome. Everyone, moreover, is aware that it matters, and that it matters to them personally. In this regard, the Witcher Cycle is far more radical in its departure from heroic convention: the central conflict between Nilfgaard and the Northern Kingdoms doesn’t matter, beyond the death and destruction it creates: there is little appreciable difference among the belligerents, and their interests are remote from those of nearly everyone else. At the same time, Baptism of Fire contains a very clear notion of what heroism looks like in such a context—a primarily symbolic heroism like that found in the hardboiled variant of noir fiction. Geralt is no "white Knight"; rather, like Chandler’s Marlowe, he is an ethical man in a sociopathic age, swimming against the tide of darkness. As Marlowe finds in the dark recesses of Los Angeles, that tide may be insurmountable. But the presence of some goodness, divorced from simple self-preservation or the acquisition of power, is in and of itself redemptive, or at least suggests that redemption is still possible. There are also differences of scale. Though Martin’s strength as a writer, arguably, is his tight focus on character, the series is unmistakably epic in scope. Baptism of Fire, feels decidedly microscopic in comparison. The political conflict happens around Geralt, Ciri and the others, though it frequently threatens to envelope them. 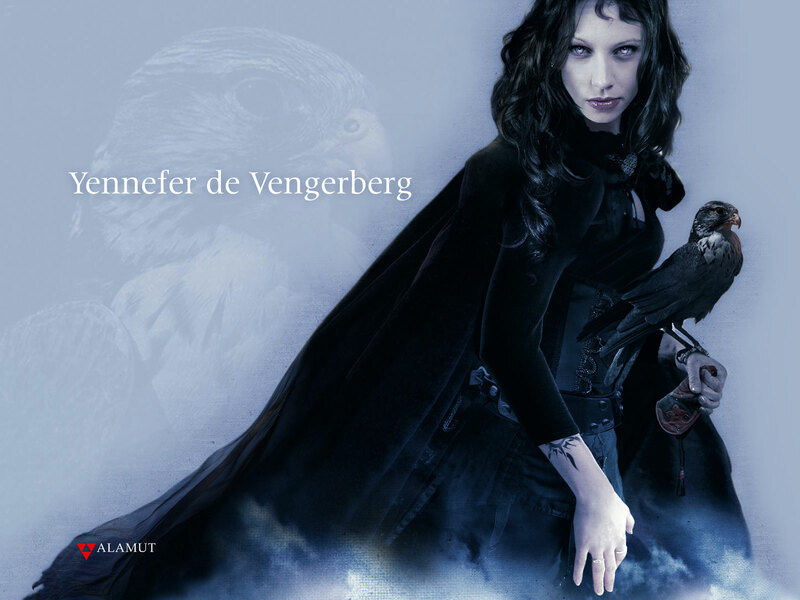 There are a few passages—mostly involving Redanian spymaster Dijkstra or his unrequited love, the sorceress Philippa Eilhart—that do speak to the grand conflict. But the bulk of action, whether following Geralt or Ciri, focus on small vignettes, and are constructed out of Sapkowski’s sophisticated, elliptical dialogue. What’s more, despite the grim darkness of the world it presents, Baptism of Fire is nonetheless charming and funny, and is in another sense a celebration of good companionship. The new characters introduced in this volume are wonderful additions. Fans of the video game series will rejoice at the introduction of Zoltan Chivay, while Milva exactly the kind of independent and highly competent female character many critics find lacking in male-authored gritty fantasy. But my personal favorite is Emiel Regis Rohellec Terzief-Godefroy (aka Regis), the teetotaler vampire, because he, more than any other character in the series to date, best exemplifies Sapkowski’s quirky humor. 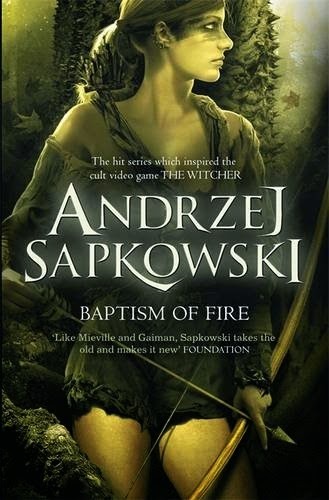 In sum, while perhaps not transcendent in the manner of its immediate predecessor, Baptism of Fire nevertheless solidifies the Witcher Cycle as one of the best and most interesting fantasy series I’ve ever read. Though it functions well as adventure fiction, it has added depth and value as satire and commentary on fantasy literature. Moreover, though there are many good writers working in fantasy, Sapkowski is a genuine stylist. His prose is not as dense as Gene Wolfe’s, or as elegant as Elizabeth Bear’s, but it is supremely clever—hiding texts and subtexts in the most innocuous of places—and uniquely playful. I see a clear affinity with Latin American greats Luis Borges and Roberto Bolaño—an affinity that may go far in explaining Sapkowski’s immense popularity in Spanish translation. That’s rare praise for a genre writer, and especially for one who plies his trade in epic fantasy—a category of fiction that is only rarely, to invert Gene Wolfe’s turn of phrase, magic realism in English. Bonuses: +1 for Milva, Zoltan and Regis. Penalties: -1 for relative lack of Yennefer and Ciri.